Welcome to Open Sourcemap. To begin with, you'll need to register an account. Click Register on the top right corner of the page. Create your profile. Once you have completed your profile, check your email for a verification message. Your account is not active until you verify your email. This is what you will see on your profile page in case you have not yet verified your email address. Provide a name, description and select an industry. 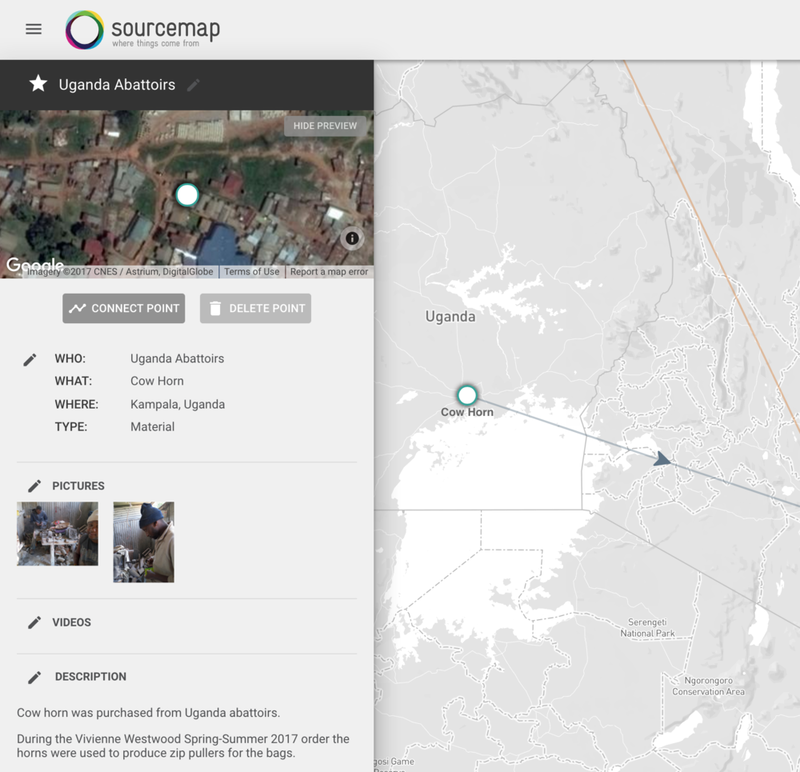 These will be used to help visitors to Open Sourcemap find your supply chain map. When you create a supply chain map, an empty map will load with the 'Add a Point' window open. Click “Take a Tour” in the “Add a Point” window for a step-by-step tutorial. A point on a map represents a location where materials are sourced (such as a farm or a mine), a location where materials are processed (such as a refinery or a mill), a location where products are manufactured (such as a workshop or a factory), a location where products are distributed (such as a warehouse or a distribution center, a location where products are sold (such as a retailer or a market), or a location where a product ends up (such as a customer or a landfill). To add a point, select the type of point you’d like to add from the options in the “Add a Point” window. If the “Add a Point” window disappears, click the "i" button in the navigation bar at the bottom of the map page. -What: The name of the part, thing, finished good, etc. -Where: The address, which can be a country name, city name, or street address. Add photos, videos and descriptions by clicking on the pencil icon next to those sections of the pane and selecting 'SAVE" when finished. NEW: You can format text using markdown code. Below are some samples. As soon as you have more than one point, you can link them by using the "Connect Point" button at the top of the point window. Just click the "Connect Point" button and then select the point that you want to connect to. To change the map background clicks on the layer button on the zoom bar at the bottom of any map. Official accounts are reserved for users who are depicting an accurate map of a supply chain, either because they represent a company or another stakeholder with direct knowledge of the supply chain. Official accounts are featured on the home page, they bear the organization's logo and banner image, and can include an Instagram feed. To apply for official account status, visit this page: http://www.sourcemap.com/official. Official account holders can add a custom banner image and color on the profile page.